There’s no doubt that this apparatus helped inspire the design of tricycles, bicycles and therefore also the motor car. The Bath Chair is a very simple affair: you can see the tiller steering handle in the photos above. The passenger can be pulled using this front handle when this tiller is facing forward; or this steering handle can be turned to face the passenger who can steer the chair while it’s being pushed from behind. Though its contribution is generally ignored, overshadowed as it was by the bicycle, the humble Bath Chair played a very important part in our motoring history. Its use was initially limited to spa towns, but the Bath Chair was the bridge between the sedan chair, carried by two porters or chairmen, and self-propelled invalid carriages and tricycles. The city of Bath’s website claims the ‘Bath Chair’ was invented by James Heath of Bath around 1750, while other websites say it was invented by John Dawson of Bath, in 1783. This clearly illustrates how easily the internet can change history! Both Heath and Dawson manufactured Bath Chairs in Bath. Before Bath Chairs came into use, sedan chairs were used to carry the infirm. Fashion of the 1770s dictated ‘towering feathered heads’ – extravaganzas of the hairdressers’ art – and this inspired The Bath Chairmen’s Petition, part of which I’ve quoted above. By 1830, the bath chair had replaced the sedan chair as a conventional means of transport. Bath Chairs were used for transporting folks to sample the waters at the Pump Room or to bathe in the Baths. By 1907, when these pictures were taken, they were a common sight in the city of Bath, as well as in Tunbridge Wells and Buxton. By the late 18th century, the first chairs on wheels were beginning to appear in the city. Unlike the old established vinaigrette in Paris, wheeled chairs in Georgian Bath were seen as purely invalid vehicles, appropriate enough to conduct the aged Beau Nash to the rooms in, but hardly a means of transportation otherwise. The commonest type to be met with by the later eighteenth century was perhaps the Merlin chair [a sedan chair with two wheels], brainchild of the extraordinary Belgian inventor and mechanic, J.J. Merlin, one of whose supposedly health-giving swings long served as an attraction at Bath’s Sydney Gardens. As Fanny Burney discovered during her stay in 1791, even the half-paralysed Lady Duncannon was able to propel her Merlin chair unaided across the room [Fanny Burney: The Journals and Letters]. If it was the standard model, self-propulsion was achieved by turning wheels attached to larger driving wheels of what looked in other respects something like an armchair. In 1829 Bath magistrates approved a Hackney carriage service around the city. Brighton had sanctioned a ‘fly’ service in 1816 – a ‘fly’ was a light, four-wheeled, one-horse vehicle – and this fashion had spread. 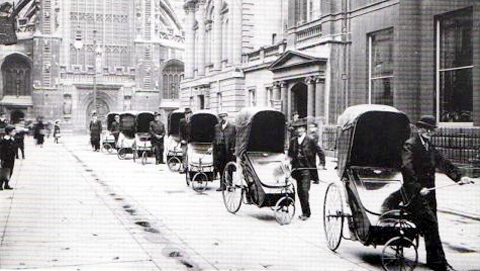 The old sedan chairs were extinct by 1850, with Bath Chairs taking their place for the infirm and hackney carriages such as the fly providing transport for able folks who were in a hurry. 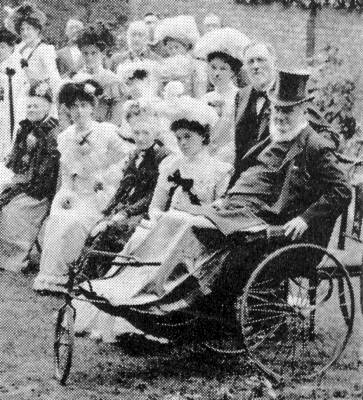 By the late 1850s in Bath there were 162 Bath Chairs available for hire. While the early chairs used in streets had hoods, late Victorian examples did not. Bath chairs continued to be used until WW1 when, due to the number of wounded soldiers, self-propelling invalid carriages took their place. This Bath Chair has a spring metal frame supported by 26 inch solid tyred wheels. The steering wheel, also with solid tyre, is 15 inch; this latter wheel is controlled by a tiller. The wicker seat is more recent. The turned handles on the tiller and on the rear of the Bath Chair show signs of woodworm; it would be easy to make replacements. Otherwise this apparatus is in good operational condition throughout. Thomas Hughes of Birmingham made bone shakers in the early years of cycle manufacture. Items made by the company around the turn of the century include children’s tricycles and bath chairs. By 1923 they were building sidecars, and coach-built bodies for the Austin Seven.